So many moments on a wedding day can be special, unique, and often incredibly intimate. We each have our favorites. Some people love the look on the groom as he sees his bride walking down the isle, others love the first kiss. 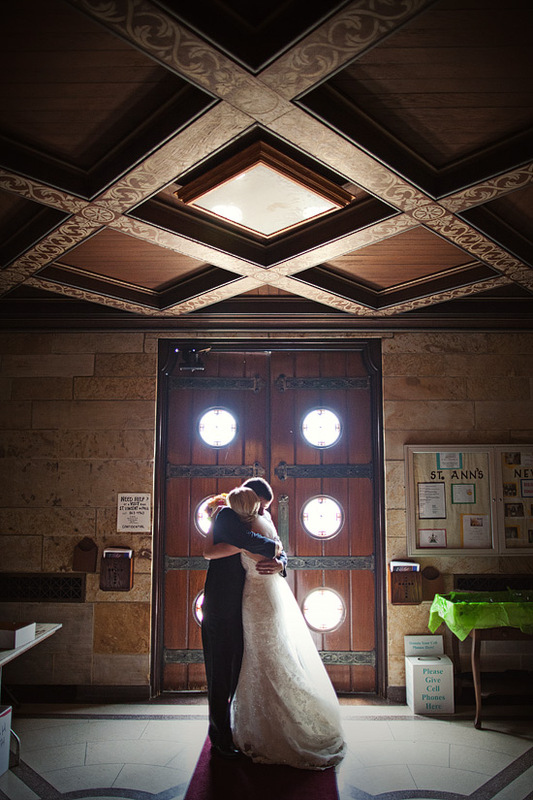 Without a doubt, my absolute favorite part of a wedding is when the bride and groom exit after the ceremony, typically sharing a warm embrace once outside of everyone’s view. They are able to finally drown out the world and everything around them, squeeze tightly- all inhibitions lost. All the planning, thought, and the many details are set aside. The weight of the day is lifted. Because now……you are married to your love. Drew and Molly are pictured above. This was captured moments before they knew we were there. To me, it was the most magical moment of the day. Gabe - love this frame. a moment that they will look back on for years and years. a frame that they will show their kids kids. amazing image guys. amanda - This is amazing – wonderful image. Jeff Schaefer - Great moment. Is that St. Ann Lindenwald / Hamilton. Hope it wasn’t too hot that day. Alyson Gawrych - Wow, Jess! Great Job. I was filled with emotion reading that they didn’t know you were there. LOVE is GRAND! Beautiful work, as always. Jennifer Nichols - What a beautiful moment you have captured! You two have such amazing talent!! Keaton - Love the little things in the room, especially the “Please Leave Cell Phones Here” box. You two have such great talent to catch these awe inspiring moments. Love it!! Cathy Nichols - you really captured a lot beautifully here and your preface is so true! happy happy love can’t wait to see the rest! Molly - Wow! Jess this is amazing! First off- you are right- we didnt know you were there. Second- I had completely forgotten about this moment – but you captured it and it brought back so much happiness/emotion when I saw this- It was the best hug in the world! I can’t wait to see the rest of the pictures! I am so excited!!! Bernadette Zimmerman - This picture brought tears to my eyes. There is nothing more precious than the hope in a shared future. This picture illustrates hope, thankfulness, and support. Shari Callahan - Beautiful, brings tears to my eyes. Sweet Love!! love to visit here in this space and absorb all this beautiful goodness!! Max - Great capture and I love negative space composition.